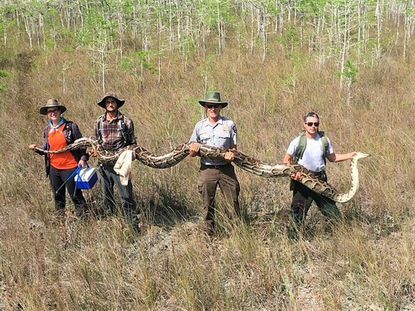 Tens of thousands of Burmese pythons are now estimated to be living in Florida's Everglades. The pythons, an invasive species overrunning the Everglades, pose a significant risk to local wildlife. Some 1,600 people registered for the inaugural Python Challenge in 2013, organized by the Florida Fish and Wildlife Conservation Commission. The searchers, however, managed to find only 68 snakes.